Its been a few days that weather department and multiple news agencies are reporting that monsoon has covered the entire nation. Well, it has not quite yet. Still, there are some parts in Rajasthan where monsoon has not reached yet. Places like Jaipur, Alwar are still covered in hot weather. It was a sultry day in Delhi and some parts in NCR with the mercury settling at 37.8 degrees Celsius. 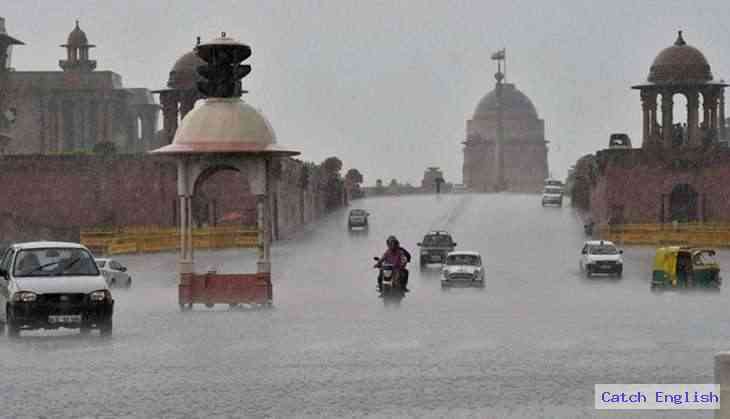 In the evening, rain lashed parts of Delhi after dust-laden winds swept across the city. "The minimum temperature settled at 29.9 degrees Celsius, two notches above normal," a MeT Department official said. The humidity levels oscillated between 77 and 49 per cent. According to a weather expert, the partly cloudy sky will be witnessed for tomorrow morning with the possibility of rain in some areas. "The maximum and minimum temperatures are likely to settle around 38 and 30 degrees Celsius, respectively," the official added. On Sunday, the maximum temperature was recorded at 36.4 degrees Celsius while the minimum temperature had settled at 29 degrees Celsius. South Rajasthan, West Madhya Pradesh and Kutch region of Gujarat would see dry weather. South Gujarat and East Madhya Pradesh may see light rains, while Chhattisgarh and parts of Vidarbha could see light to moderate rains. Meanwhile, off-shore trough running from South Maharashtra to Lakshadweep would give moderate showers over Konkan & Goa including Mumbai and Coastal Karnataka. Light to moderate rains will also occur over Kerala and parts of Tamil Nadu, while Coastal Andhra Pradesh and Telangana would see Isolated rains only.